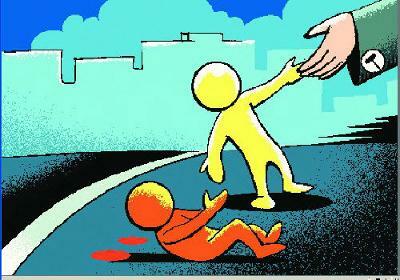 to 'respectfully' deal with good Samaritans and bystanders who rush road crash victims to hospitals or inform police. The SOP says no such person must be asked to reveal personal details, including full name, address and phone number unless he/ she volunteers to become an eyewitness. Every year 1.4 lakh people die in road crashes in India and government reports suggest that at least 50% of the fatalities can be averted if the victims are admitted to a hospital within the first one hour of a crash, called the 'golden hour'. Many of these lives could have been saved, if they had received timely help. But due to the apathy of society many people just passed by people as they lay in critical conditions. This apathy is mostly due to people being scared of police and legal proceedings hence hesitating to get victims the help they require. 2. In case a Good Samaritan chooses to be a witness, his examination by the investigating officer shall, as far as possible, be conducted at a time and place of his convenience such as his place of residence or business, and the investigation officer shall be dressed in plain clothes, unless the Good Samaritan chooses to visit the police station. 3. Where the examination of the Good Samaritan is not possible to be conducted at a time and place of his convenience and the Good Samaritan is required by the Investigation Officer to visit the police station, the reasons for the same shall be recorded by such officer in writing. 4. In case a Good Samaritan so chooses to visit the Police Station, he shall be examined in a single examination in a reasonable and time-bound manner, without causing any undue delay. 5. In case the Good Samaritan speaks a language other than the language of the Investigating Officer or the local language of the respective jurisdiction, the Investigating Officer shall arrange for an interpreter. 6. Where a Good Samaritan declares himself to be an eye-witness, he shall be allowed to give his evidence on affidavit, in accordance with section 296 of the Code of Criminal Procedure, 1973 (2 of 1974) which refers to Evidence in Formal Character on Affidavit. 7. The complete statement or affidavit of such Good Samaritan shall be recorded by the Police official while conducting the investigation in a single examination. 8. In case the attendance of the Good Samaritan cannot be procured without delay, expense or inconvenience which, under the circumstances of the case, would be unreasonable, or his examination is unable to take place at a time and place of his convenience, the Court of Magistrate may appoint a commission for the examination of the Good Samaritan in accordance with section 284 of the Code of Criminal Procedure, 1973 (2 of 1974) on an application by the concerned.